This marker, on Route 66 between Vandergrift and Leechburg, marks the point where the Kittanning Path crossed the Kiskiminetas River. 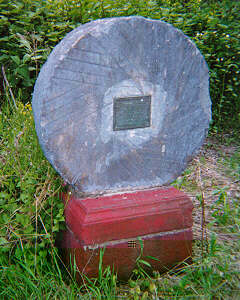 It stands on the Armstrong County (northern) bank, opposite the site of Kiskiminetas Old Town. The plaque commemorates crossings by Christian Frederick Post and Conrad Weiser, who were emissaries from the settlers to the Indians. In Conrad Weiser's Journal for Aug. 25, 1778, is this entry--"Crossed Kiskeminetoes creek and came to Ohio [Allegheny] river that day." Mr. Smith in his History of Armstrong county, commenting on this says: "The point where they crossed the Kiskiminetas must have been at the ford just below the mouth of Carnahan's (formerly Old Town) Run, having the latter name on Reading Howell's Map, so called from Old Town, on the opposite or Westmoreland side of the river." "Pisquetomen [a friendly Indian with him], led us up on a steep hill, that our horses could hardly get up; and Thomas Hickman's [another Indian with him] horse tumbled, and rolled down the hill like a wheel; on which he grew angry; and would go no further with us and said he would go by himself. It happened we found a path on the top of the hill. At three o'clock we came to Kiskemeneco, an old Indian town, a rich bottom, well timbered, good fine English grass, well watered, and lays waste since the war began." Mr. Smith thus says further: "The writer infers that Kiskemeneco must have been Old Town, from which the first name of Carnahan's run was derived, and that Weiser and his party crossed the Kiskiminetas at the ford just below the mouth of that run.